There has been a significant increase in oil train traffic in Seattle in the last few years. Oil trains carrying Bakken crude from North Dakota to refineries in the Pacific Northwest travel along the shores of Puget Sound, passing right through downtown Seattle. An average three oil trains pass through Seattle every day, traveling through highly populated and touristic destinations such as Seattle’s downtown waterfront, Safeco Field, and Century Link Stadium. The risk of oil train derailments threatens public safety, especially due to the high volatility of Bakken crude oil. On July 24th, 2014, a train carrying Bakken oil derailed near the Magnolia Bridge in Seattle. Luckily, the Magnolia derailment did not leak oil and there were no injuries. However, oil train derailments can be very severe, as demonstrated by the oil train derailment in Lac-Mégantic, Canada on July 6th, 2013, which resulted in a large explosion and fire, killing 47 people. An oil train disaster in Seattle would not only put residents at risk, but would also cause irreversible damage to the Puget Sound ecosystem, threatening the abundance and diversity of marine wildlife, including salmon that support the local economy. Coal trains traveling through Seattle also impact land and marine environments on a daily basis. Effects of coal transport-by-rail include marine habitat degradation, decreased water quality, increased ocean acidity from the burning of coal, and carbon pollution from the transport, export, and consumption of coal, contributing to global climate change. Regional coal and oil terminal and refinery proposals threaten to increase fossil fuel-by-rail transports through Seattle, further compromising the Puget Sound and the health and safety of the life that resides there. 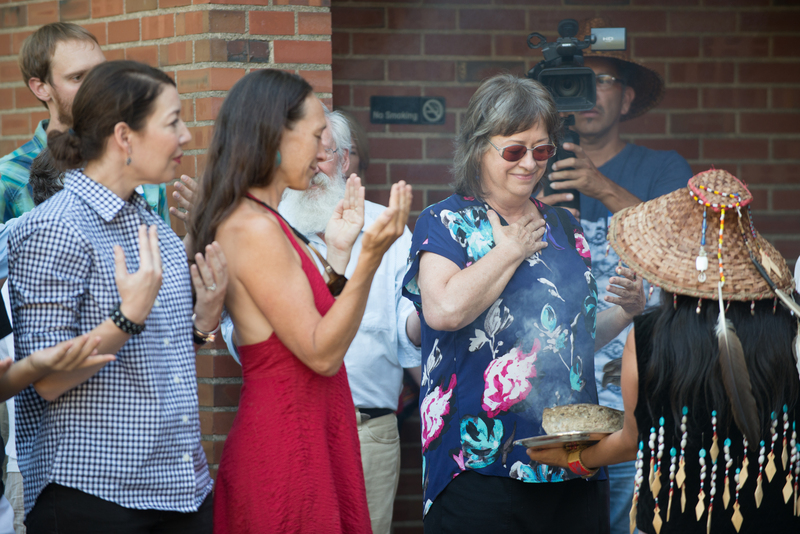 Grace Ann Byrd of the Nisqually Indian Tribe and Nisqually Farms attended the Longview Blessing Ceremony as a representative of Nisqually and shared a few words about fossil fuel export plans and the Lummi Totem Pole Journey. Jessie has been a tireless ally of the Lummi Totem Pole Journey and she worked hard to co-organize a beautiful and powerful blessing ceremony at St. Marks Cathedral in Seattle on August 25th, 2016 for this years journey. Earth Ministry is Washington State’s Chapter of Interfaith Power and Light a faith-based organization working to address climate change. Marc helped organize the Seattle stop for the 2016 Totem Pole Journey. He has worked for the Sierra Club for a longtime and helped lead PNW resistance to coal and fossil fuel transport and export plans for the last five years. There are moments on the road when the monotony of the journey makes more room for inspired conversation. Passing across the border and making our way through Lummi Indian territory, my Lummi companion imagined how the landscape had changed since the arrival of the settlers. He could almost see how it had been seen. We know that the sockeye salmon run, since the early twentieth century, has been reduced by 95%. This year there will not be a sockeye fishery. Blame it on the “blob” or intervention on the high seas. One thing we do know, one of the world’s most remarkable temperate rainforests that once stretched unbroken from British Columbia to northern California has been reduced to isolated, fragile remnants, in the span of a few generations. It made my companion wonder—not for the first time—when, as the writer Wendell Berry put it, will the settlers finally be home, here? The beauty still makes wonder, but also makes us wonder: what happened? It also makes the event in Seattle that much more inspired and inspiring. Over 500 people from across western Washington came to St. Mark’s cathedral on Thursday to see, touch and sense the totem pole. They were greeted at the entryway to the church by a lineal descendant of Chief Seattle, and regaled and sung into being present by the Seattle Peace Chorus. For the next two hours they were able to escape the acid bath of what passes for politics in the American Nation. They heard from the Episcopalian speaker that announced the Episcopalian Church had issued a statement the day before in support of the resistance at Standing Rock to the Dakota Pipeline. Chief Phil Lane, Jr. of the Yankton Sioux Nation spoke about how all persons are sacred beings and how the earth was being torn and terrorized by those with no care for tomorrow, for their grandchildren, or this great good earth. Shasta Cano Martin of the Lummi Indian Business Council called upon those present to be involved and stay involved. She talked about the against-all-odds Lummi victory over a proposed coal port at Xwe’chi’eXen (Cherry Point) in which the Lummi Indians, their voices amplified by tens of thousands of non-Indians, prevailed over a juggernaut of corporate power. She called it a turning point not only in people working together towards the power of one, but also in bringing to an end the onslaught of coal and oil that threatens us all, and the place we call home. Behind the speakers, above the altar, was the Sacred Obligations mural. This 24’ by 14’ artwork, directed by the participatory muralist Melanie Schambach and created by individuals across the Pacific Northwest and Canada, illuminated the event with its sublime beauty. The mural manages to say it all in a collage of the circle of life in which one image creates the other. It speaks to Mr. James’ imploring people to get involved and stay involved: never give up! It was a witness to Chief Lane’s beseeching those visible and unseen to be of one mind in a celebration of the creation. It was a moving experience. It always is when the totem pole is blessed at St. Mark’s by good, decent, and caring people who, as Lummi tribal member and totem pole journeyer “came to share this moment of time, this breath of life.” It was a day for the angels. As the smoke rises the smudging or cleansing smoke bath bath takes our prayers to the Spirit World where our Grandfathers and the Creator resides. Negative energy, feelings, emotions are lifted away. A cleansing smoke bath ritual is a way to purify the body, aura, energy, and as the smoke rises our prayers rise to the Spirit World where the Grandfathers and the Creator resides. In Seattle on August 25th, a profound event took place in St. Mark’s Cathedral on Capitol Hill, owing to the setting for the event and the phenomenal organization of all the people involved with planning the event. The mural that was drawn during Totem Journey 2015 was hung behind the altar in the cathedral, to striking effect. And the echoing inside the building added to the drama and magic of the gathering. Over 400 people were in attendance and were treated to plates full of information. 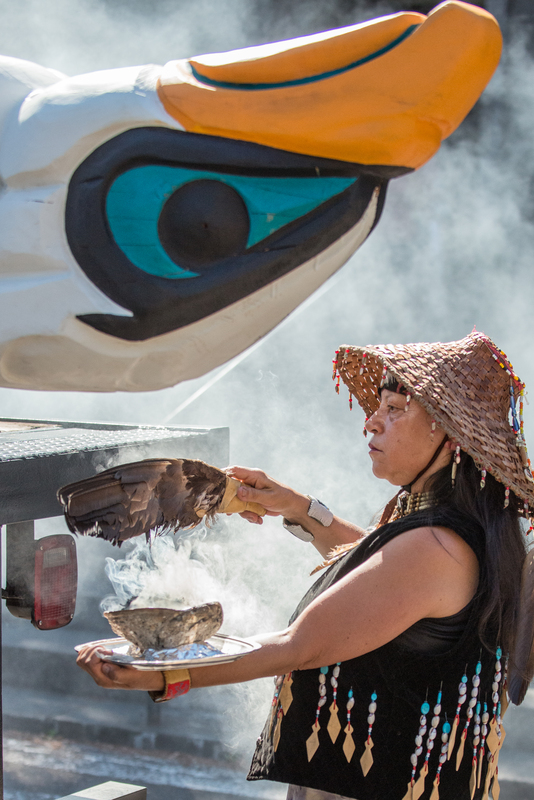 The totem pole was parked immediately outside the doors to the cathedral and the events began with a smudging of the pole by Lummi elders, Linda Sorriano and Randy Peters. The Seattle Peace Choir provided music that poignantly bookmarked the entire event, including an inspiring marching song during the closing of the ceremonies. A key development came from the Episcopal Church Authority, expressing their unconditional support of the Standing Rock Sioux Nation in opposition to the Dakota Access Pipeline. For more information, see this article at the Episcopal News Service. The event featured presentations by Ken Workman of the Duwamish Tribe, Shasta Cano-Martin, Secretary of the Lummi Indian Business Council, Chief Phil Lane, Jr., Hereditary Chief of the White Swan Dakotas, Tarika Powell, Senior Research Associate for the Sightline Institute, Father Patrick J. Twohy, a Jesuit Priest, Jewell Praying Wolf James, a Lummi Nation elder and the Master Carver of the Lummi House of Tears Carvers, and LeeAnne Beres, the Executive Director of Earth Ministry/Washington Interfaith Power and Light. Jewell Praying Wolf James explained all the elements of the totem to us at the request of an audience member. From the top of the pole, the first element is the all-seeing eagle, who provides the leadership; the second element is the full moon on the chest of the eagle, where in the eastern sky as the moon rises one can see an Indian sitting with his legs crossed and bowed head with two feathers; the third element is Father Sky; the fourth element on the left side of the totem is the sitting bear, for strength and endurance in the struggle of life; the fifth element on the right side of the totem next to the bear is the wolf who scouts and reports danger; between them is the spear, but neither bear nor wolf touch the spear, reflecting that they are in peace and harmony; the sixth element is a cluster of four white buffalo with white coat, pink around their lips, noses, and eyes, and red pupil of the eye; the seventh element is the medicine wheel, the four quadrants being painted red, black, yellow, and white to represent all peoples; the eighth element at the bottom left of the pole is the pipe carrier ready to start a prayer and come in peace; the ninth element at the bottom right of the pole is the warrior on the peyote trail, representing the over 10,000-year-old church; and all of the bottom elements of the pole are surrounded by the green of Mother Earth. The wing for the totem pole has one figure on each side, the prayer flute player on one side and the love flute player on the other. The wing will be mounted behind the eagle. 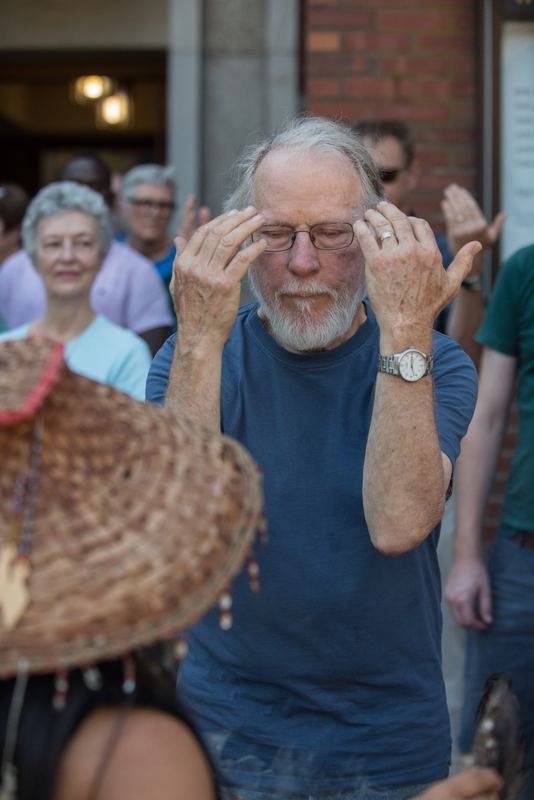 Following the formalities inside St. Mark’s Cathedral, the audience was invited to come outside to the pole to bless the pole, sending personal prayers with the journey for healing for the Earth and love, compassion, and empathy for all of Earth’s creatures. Also, the audience was invited to stay and visit with free donuts from a local vendor, and other foods provided by a couple of Seattle food trucks. As people mingled and connected, the energy of the crowd was intense and serene. The event was co-hosted by St. Mark’s Cathedral, Earth Ministry, and the Sierra Club. Jessica Dye of Earth Ministry was the key organizer and had invaluable assistance from Susan Nicoll of St. Marks. Caleb Heeringa represented the Sierra Club and many others donated their valuable time for a remarkable event.